Bengali New Year (Bengali: নববর্ষ Nôbobôrsho) or Poyela Boishakh (পহেলা বৈশাখ Pôhela Boishakh or পয়লা বৈশাখ Pôela Boishakh) is the first day of the Bengali calendar, celebrated in both Bangladesh and West Bengal, and in Bengali communities in Assam and Tripura. It coincides with the New Year's Days of numerous Southern Asian calendars. Poila Boishakh connects all ethnic Bengalis irrespective of religious and regional differences. In India, in West Bengal and Assam it is a public (state) holiday and is publicly celebrated in mid April. In Bangladesh, it is a national holiday celebrated around 14 April according to the official amended calendar designed by the Bangla Academy. New Year's festivities are closely linked with rural life in Bengal. Usually on Pohela Boishakh, the home is thoroughly scrubbed and cleaned; people bathe early in the morning and dress in fine clothes. They spend much of the day visiting relatives, friends and neighbours. Special foods are prepared to entertain guests. This is one rural festival that has become enormously big in the cities, especially in Dhaka. Boishakhi fairs are arranged in many parts of the country. Various agricultural products, traditional handicrafts, toys, cosmetics, as well as various kinds of food and sweets are sold at these fairs. The fairs also provide entertainment, with singers and dancers staging jatra (traditional plays), pala gan, kobigan, jarigan, gambhira gan, gazir gan and alkap gan. They present folk songs as well as baul, marfati, murshidi and bhatiali songs. Narrative plays like Laila-Majnu, Yusuf-Zulekha and Radha-Krishna are staged. Among other attractions of these fairs are puppet shows and merry-go-rounds. Many old festivals connected with New Year's Day have disappeared, while new festivals have been added. With the abolition of the zamindari system, the punya connected with the closing of land revenue accounts has disappeared. Kite flying in Dhaka and bull racing in Munshiganj used to be very colourful events. Other popular village games and sports were horse races, bullfights, cockfights, flying pigeons, and boat racing. Some festivals, however, continue to be observed; for example, bali (wrestling) in Chittagong and gambhira in Rajshahi are still popular events. Observance of Pohela Boishakh has become popular in the cities. Early in the morning, people gather under a big tree or on the bank of a lake to witness the sunrise. Artists present songs to usher in the new year. People from all walks of life wear traditional Bengali attire: young women wear white saris with red borders, and adorn themselves with churi bangles, ful flowers, and tip (bindis). Men wear white paejama (pants) or lungi(dhoti/dhuti) (long skirt) and kurta (tunic). Many townspeople start the day with the traditional breakfast of panta bhat (rice soaked in water), green chillies, onion, and fried hilsa fish. Panta Ilish - a traditional platter of leftover rice soaked in water with fried Hilsa, supplemented with dried fish (Shutki), pickles (Achar), lentils (dal), green chillies and onion - a popular dish for the Pohela Boishakh festival. 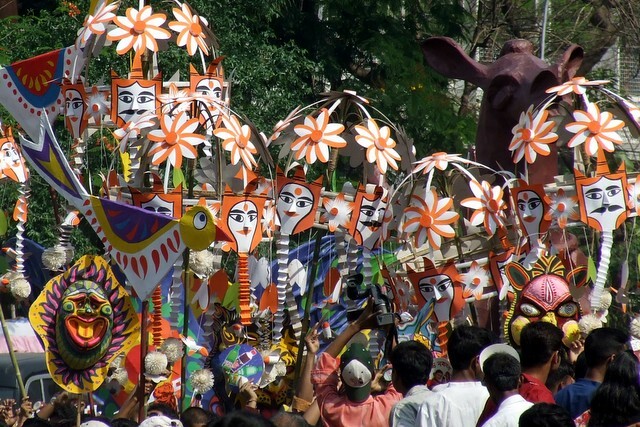 The most colourful New Year's Day festival takes place in Dhaka. Large numbers of people gather early in the morning under the banyan tree at Ramna Park where Chhayanat artists open the day with Rabindranath Tagore's famous song, এসো, হে বৈশাখ, এসো এসো Esho, he Boishakh, Esho Esho (Come, O Boishakh, Come, Come). A similar ceremony welcoming the new year is also held at the Institute of Fine Arts, University of Dhaka. Students and teachers of the institute take out a colourful procession and parade round the campus. Social and cultural organisations celebrate the day with cultural programmes. Newspapers bring out special supplements. There are also special programmes on radio and television. The historical importance of Pohela Boishakh in the Bangladeshi context may be dated from the observance of the day by Chhayanat in 1965. In an attempt to suppress Bengali culture, the Pakistani Government had banned poems written by Rabindranath Tagore, the most famous poet and writer in Bengali literature. Protesting this move, Chhayanat opened their Pohela Boishakh celebrations at Ramna Park with Tagore's song welcoming the month. The day continued to be celebrated in East Pakistan as a symbol of Bengali culture. After 1972 it became a national festival, a symbol of the Bangladesh nationalist movement and an integral part of the people's cultural heritage. Later, in the mid- 1980s the Institute of Fine Arts added colour to the day by initiating the Boishakhi parade, which is much like a carnival parade. Today, Pohela Boishakh celebrations also mark a day of cultural unity without distinction between class or religious affiliations. Of the major holidays celebrated in Bangladesh, only Pohela Boishakh comes without any preexisting expectations (specific religious identity, culture of gift-giving, etc.). Unlike holidays like Eid ul-Fitr, where dressing up in lavish clothes has become a norm, or Christmas where exchanging gifts has become an integral part of the holiday, Pohela Boishakh is really about celebrating the simpler, rural roots of the Bengal. As a result, more peoeple can participate in the festivities together without the burden of having to reveal one's class, religion, or financial capacity.